It’s my favorite of all the birds around here. Yes, I like them even better than the bald eagle, which I sometimes call the “white headed vulture” for its dumpster diving ways when close to civilization. I like the Puffin because it’s head resembles a parrot, and it’s body resembles a penguin – making it an odd-ball kind of bird, with character. They are unusual in many ways. They like to nest in areas that are inaccessible to mammalian predators – so a rocky outcropping in the middle of the bay like our Gull Island Bird Sanctuary is perfect. After that, their only predator will be of the avian variety – like eagles and falcons, which also frequent the island. But living on Gull Island Bird Sanctuary also has it’s benefits in what biologists call the “dilution factor” or, “safety in numbers.” On the island, there are also literally thousands of nesting Kittiwakes and Herring Gulls, Common Murres, and Cormorants. With all of those other birds attracting the attention of the raptors, a dozen breeding pairs of puffins can get by. Next, they don’t set their nest precariously on a ledge or tiny outcropping of rock, in plain view, like the kittiwakes and gulls. Instead, they create a burrow on the top of the island – where there’s grass. Using their feet and beak, they make a burrow, and line it with their own feathers, and also special bits of vegetation which they find on the island, floating on the ocean surface, and on other exposed rock at low tide. 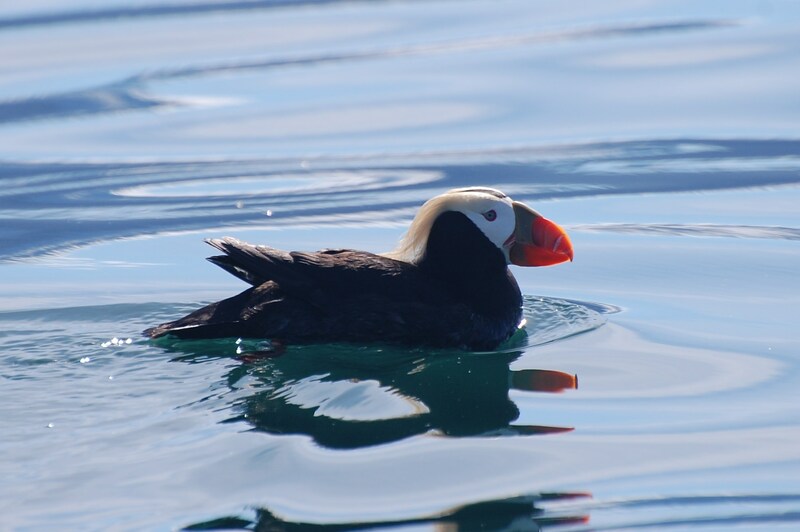 Tufted Puffins are common from British Columbia and throughout the North Pacific. They show up here in Homer late May to early June – with maybe 1-2 dozen breeding pairs that like to call Gull Island their home. In all of my wanderings, I haven’t seen them anywhere else nearby, until I reach flattop, out around Pogi Point and head for the Barren Islands. But that’s almost a two hour drive by boat, which makes this little colony that’s so close by very special. With their short, stubby little wings, they are not strong flyers. That makes them better suited to dive and catch the fish that they eat. Taking off can be a problem, especially if it is windy. I usually approach them from upwind, because they want to fly into the wind, and therefore go right past my boat, giving my guests a great look. But when it is windy, they would tend to crash into the wave in front of them (versus a puddle duck like the mallard – which would push off the water with it’s wings and go straight up). Rather than do that, Puffins would rather dive. They are strong swimmers and can stay under for several minutes – coming back up, who knows where? I have waited for a long time to see them resurface, but to no avail. The mated pair takes care of the single chick, and takes turns going out to gather small fish, which they store in their rather large beak, and bring back for the young. On a windy day when they are standing up on the ledge of the island, it is fun to watch as they glide down off the top – sometimes barely clearing my boat, as they head out to look for food, gather with friends, and socialize. Because of their short, stubby wings – they cannot soar like an eagle, so they come down at a fairly steep trajectory. Low flyers, they have to beat those little wings really fast to stay airborne. Somehow, though, they manage – wintering on the open ocean in places like Japan and California. So there is your biology lesson on the Tufted Puffin. Come stay at Majestic View Bed and Breakfast, and come see them up close and personal, with me, and Majestic View Adventures – like David and Diane Powers did. I shared several of their bear pictures a couple of days ago. Today, I will share one of the puffin images they got when they joined me on a rather spontaneous but very productive photo safari on Kachemak Bay. Stay tuned for a similar post in the near future – all about everyone’s favorite mammal, the sea otter.